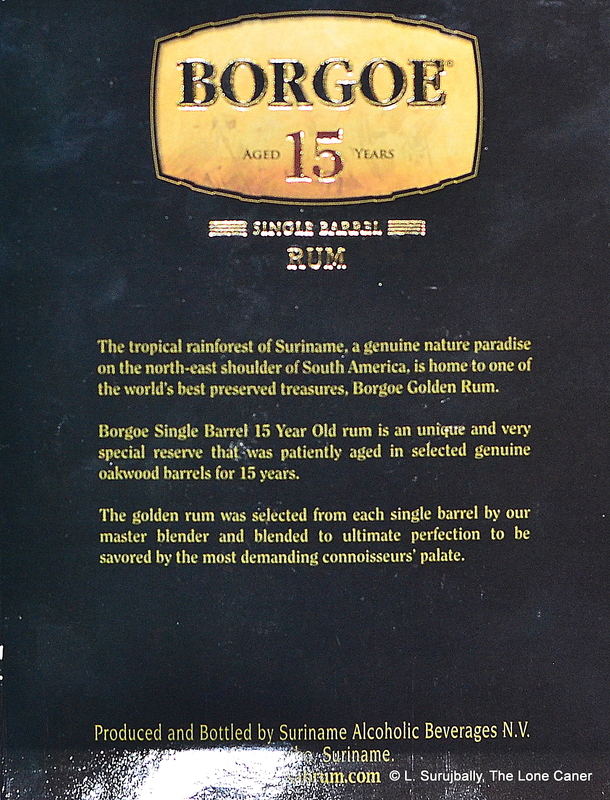 While SAB, the only real commercial rum producer in Suriname, makes competent blends and some very nice aged work (like the 8 year old from last week), it suffers, if the word can be used, from the following: a competitor to up the ante and push them harder within their own country; higher proof offerings as part of a connoisseur’s cabinet; a range of true single cask rums that highlights a particular point of interest in an overall oevre; and most of all, as I noted way back in the Extra Gold, that particular note of terroire that would mark it out and set it apart from, and over, more common table tipple. Which is not to say they’re bad – far from it. 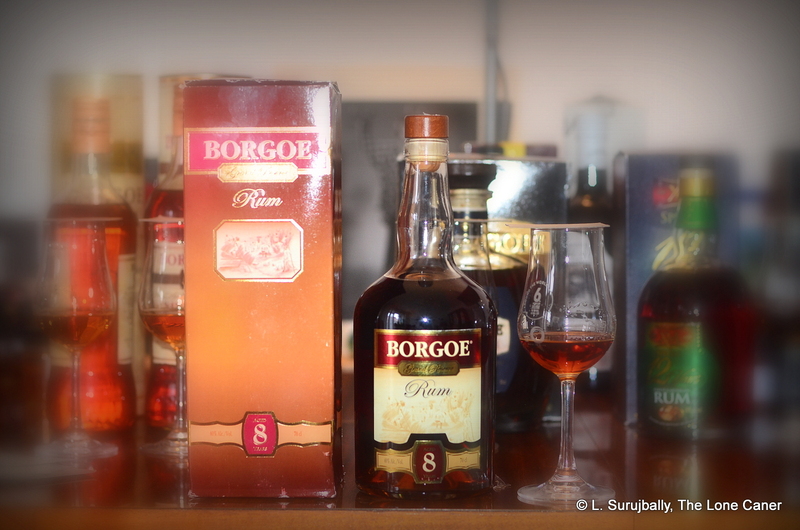 The Borgoe 8 year old was a nice step up from the earlier, younger editions, and now the 40% 15 year old takes it to its own new level, even adding a filip of individuality, because it is stated to be a single barrel aged rum — although unfortunately I’m unable to ascertain what the outturn was,or even if it is issued on a semi-regular basis. 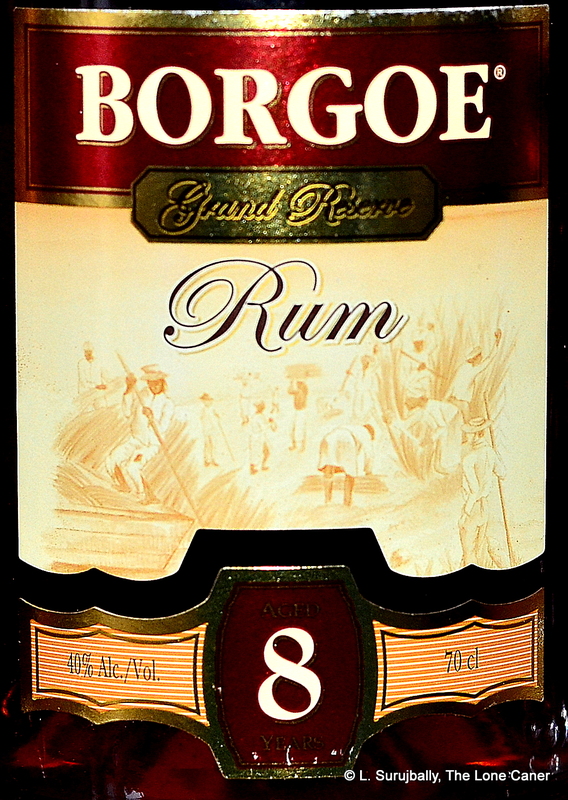 The fact that no year is mentioned on the label – single barrel rums by their nature tend to extol a year of make and a volume of bottles issued as a bare minimum – suggests that the moniker may either be totally incorrect or it’s poor advertising / quality control…because you can be sure that no independent bottler would ever make such an error. Anyway, beyond those issues, let’s take things at face value and simply accept it as a column still blend based on non-Surinamese molasses, blended from various barrels of fifteen year old reserves, issued at a milquetoast 40%, and if you’ll forgive my rampant and unconfirmed speculation, with some pot still juice mixed in there for a little edge and torque. The question is, was it any good? Yes, and it’s very much the best of the lot, even edging out the Banks DIH Supreme 15 year old, with which it shared several points of similarity. Even at 40% the difference between the various standard rums I was trying was quite impressive – creamy cereals and milk, oranges and caramel, all emerged to waft around the nose, at once. There were the scents of walnuts, coconut, tobacco, and the fruitiness of cherries and peaches in cream, with a few flower petals and nougat thrown in for good measure. And behind it all, barely noticeable, a queer clean sheen of something clear and bright and metallic, almost agricole-like….that’s the edge I was talking about, the point of distinction I liked. Tasting it was also a pleasant experience, warm and smooth and with a fine texture – it actually presented with somewhat more heft than one would expect. It was fruity, flowery and musky, all at the same time, redolent of aromatic cigarillos (those port-infused ones I used to like at one point in my life). Leading off were ripe cherries and tart yellow mangos, apricots, plums and vanilla, with enough of the sharper oak influence to give it some kick. It was vaguely (but in no way overbearingly) sweet, and with a drop or two of water provided some additional sage and nutmeg, burnt brown sugar, molasses and caramel, plus that faint but clear metallic brightness. Full proof it might not have been, but I had few complaints about what they had managed to achieve. Only the finish was somewhat of a let-down, being rather short and quick, if easy and warm and without anything new being added to the experience…sort of like an ex-girlfriend’s cheerful goodbye kiss – she knows you well enough to give you a good one, but doesn’t care enough to give you the full treatment, know what I mean? So all in all, a reasonably complex, well balanced rum which is nice to sip, a decent and very competent product by any standard. 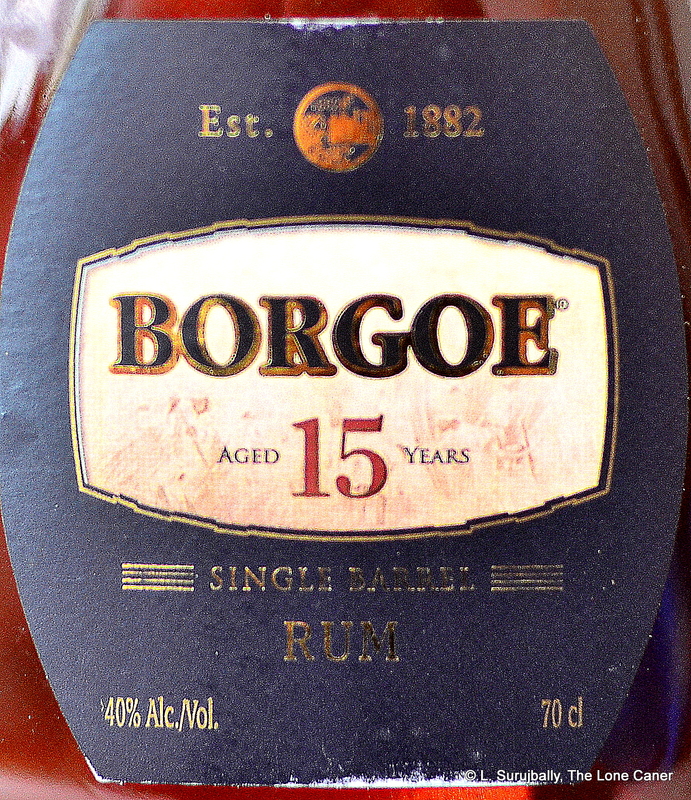 I want to make clear that as the top of the line, the Borgoe 15 year old is not a common bathtub hooch which plays it safe and doesn’t go anywhere spanking new – it’s too well made for that. But in the end, it remains a column still blend, it retains that unadventurous strength (not 46% or even 43% both of which can almost be seen as the evolving standards), and has only some of the force and uniqueness and intensity about it that would immediately mark it out as something special. Something special like a rum specifically Surinamese. Something special like a rum we must have. And that’s a shame, because with some effort and courage — some more oomph, so to speak — I would surely have marked it even higher, and liked it even more, than I actually ended up doing. I deliberately included the word “blended” in the title even though it’s not on the label, in order to not give the misleading impression that it is a true Single Barrel rum (as defined by common useage). 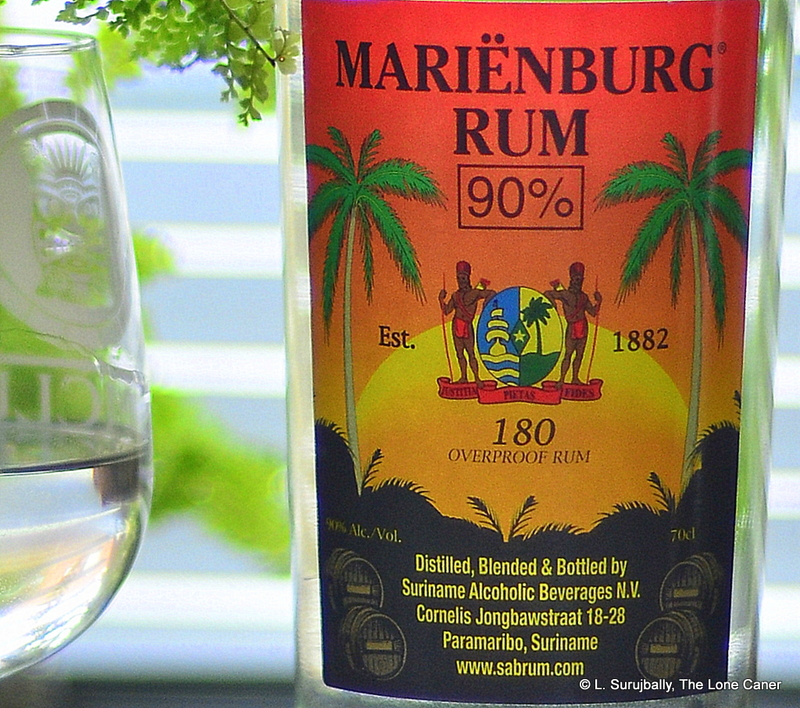 SAB is a Surinamese conglomerate that is very much like Banks DIH and DDL in Guyana – they have several different kinds of businesses in the portfolio, including various spirits, mostly sold on the local market. 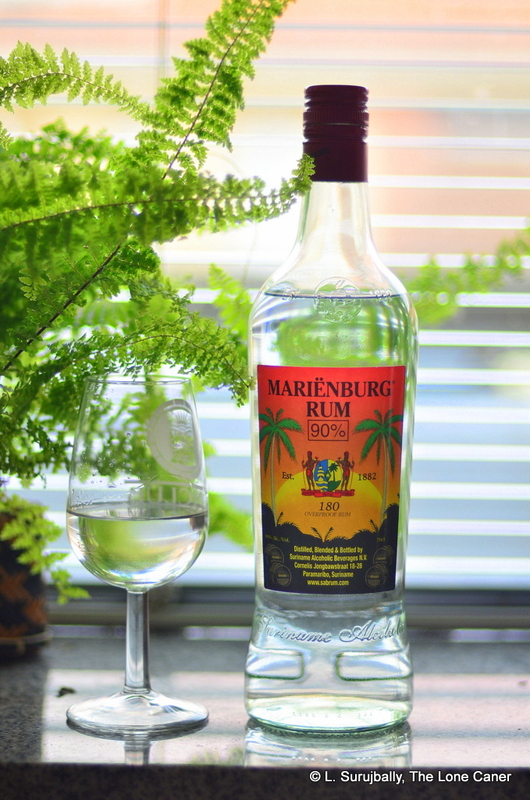 Rums are among the few of its offerings which are exported, primarily to Holland, which comes as no surprise given their historical affiliation with the Netherlands. At the time when I bought these bottles I was unaware of their availablity in Europe (which says rather more about my miserable googling skills than their advertising) and bought the entire line straight out of Suriname: to this day I’m still wondering how the Marienburg 90% made it past customs in Germany when the rather more tame ~55% Nasyonal from Mascoso nearly caused them a conniption fit. Anyway, after the uncomplicated and placid experience that was the Borgoe Extra and 5 Year Old, I am happy to report that the 8 year old is an emphatic step up the quality ladder. This is a rum aged a mere three years more than the five, but tastes and smells like a totally different product. Even at 40%, which readers are probably tired of hearing me whinge about, the Grand Reserve manages to produce a complex little tap dance that had me hastening back to all the other glasses to see if it was just me. To say that about a standard proof product these days is making a rather interesting statement about what it delivers. Take first the nose, which alleviated many of my issues with the previous rums from the company. It started off warm and spicy, offering salty caramel ice cream, molasses, raisins, and bananas just starting to go off. It didn’t burst out of the bottle to overwhelm and cudgel you in the face – it wasn’t that kind of drink; it more like tip-toed out, to slyly coil its way around the nose, gentle and easy, but each note initially distinct, before melting into a pleasant mélange. It also developed well, because after some minutes, one could sense a thin line of citrus-like tartness, like gooseberries, unripe mangos leavened with some nuts, perhaps some vanilla, and smoke and leather. This all took some time and concentration, to be sure, because its very mildness required some effort. The palate was somewhat more assertive and less difficult to analyze. First there were waves of caramel and candied oranges, more pronounced molasses, plus a musky background of cumin and masala spices which were not overwhelming but simply stayed in the background with an occasional wave to show they were still there. With water (not really required, but it’s part of the system, so I tried it anyway), cherries, dark chocolate, some cloves and orange peel were noticeable, and after maybe half an hour the molasses was very much a part of the profile. It also finished well, being remarkably dry, warm, with mostly citrus, leather and caramel winding up the show. Trying to come to grips with the 8 year old was hindered by the very gentleness and kinks that made it interesting. I wouldn’t go so far as to say it was a massively sophisticated sub-ten-year-old (I believe that that particular crown belongs for the most part to agricoles), and it certainly did not have the rough-hewn elemental brutality of a cask strength bruiser, but it was a nice, easy drink, soft enough to please, with just enough edge on it to provide a slightly askew drinking experience. Dave Russell of the Rum Gallery (who tried it at least three times), remarked in his review that it had a “soft polite touch”, and I think he pretty much called it as it was — so rather than indulge my windy vocabulary, I think I’ll let this write-up rest with that pithy and appropriate conclusion. Column still blend, aged in American white oak ex-bourbon barrels. I remarked in the review of the 5 year old that there’s a pot still floating around SAB’s premises, and I can’t rid myself of the feeling that there’s some of that in this rum. It’s just an opinion, though. Adheres to the Authentic Caribbean Rum (ACR) standard, so we can assume no colouring, additives or sugar. I’ll wrap things up for Borgoe line with the 15 year old next week. That might be damning it with faint praise, but not really. The nose gives an indication of what’s in store: it meanders out calmly and easily, warm and without bite, a little creamy at first; it presents as somewhat sweet, though not overly so – and after settling down, if one takes one’s time with it, there are additional and faint background notes of breakfast spices (nutmeg and cinnamon, perhaps a clove or two), plus cereals, nuts, a little vanilla and some flowers. It’s certainly not reaching for the stars and seems content to stay with simplicity for effect. The palate demonstrates more of that placid nature: again it was warm and not altogether spicy or sharp, and although it did seem somewhat thinner than one accustomed to more powerful drinks might appreciate, it was also reasonably smooth, and a rung or two up the ladder from the Extra. Crème brulee, caramel and molasses were the dominant notes at the inception, with vanilla and some oaken tannins bringing up the rear. Setting it aside for some minutes is probably a good idea for those who want more: after a while, subtler flavours crop up, citrus, flowers, guavas, a few watery pears and a sharper slice of green apple in the mix there someplace. I particularly enjoyed the languid French toast and honey that shyly danced in the background, and again the breakfast spices were there, not as distinct as the nose suggested they might be. The finish, short and faint as it was, was at least aromatic, with the fruits fading fast now, and mostly showing off some sweet tangerines and caramel. All right then, let’s sum up. For one used to aggressive young agricoles and fullproofs of any age, this is probably a rum to avoid, since everything is very much dialed down with a feather blanket, and it might work best in a delicate mix that others know more about than I do. It’s pleasant and inoffensive, as noted above, and I find it too bland to appeal to me personally. 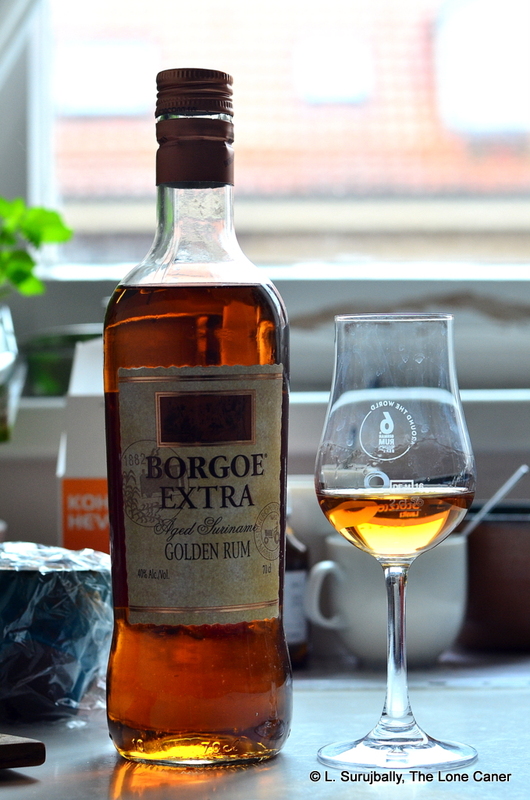 Perhaps its real issue – one that would not lead to parades of rabid aficionados cluttering up whole Facebook pages with songs of praise – is the fact that is still somewhat generic, and seems have no problem in being an agreeable but indeterminate rum, one that simply exists. 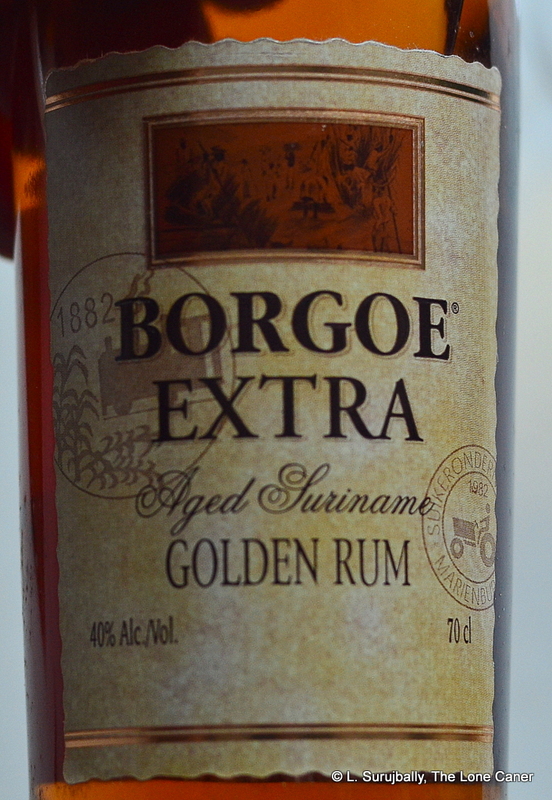 Rather than anything particularly Surinamese, it reminds me of a Botran 15 Solera, a Cacique 500, or a Tres Hombres rum. It’s light, easy and uncomplicated enough to take by itself, but this comes at the expense of some originality and were I to come back to it sight unseen a month from now, I’m not entirely sure I’d remember it clearly. For the kind of quality I was looking for, I had to go up to the 8 and 15 year old expressions, which we’ll look at next time. 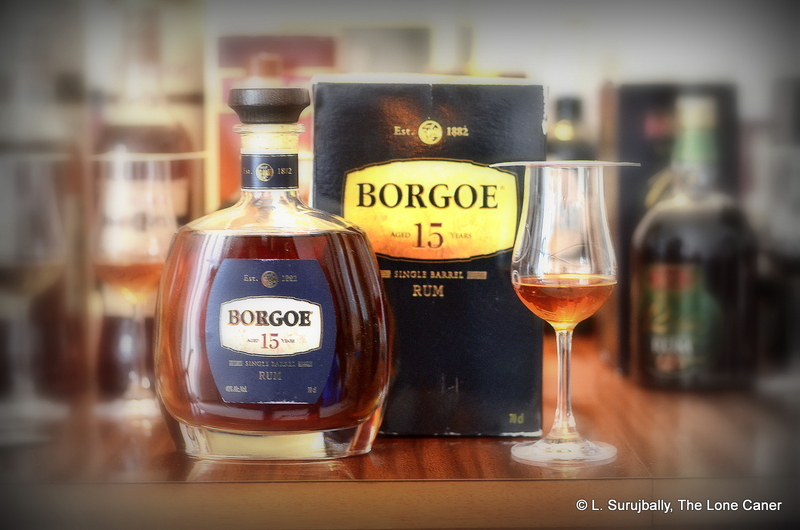 There is no shortage of agricoles, independent bottlers and flavour-of-the-month rums in my notebooks — but in late 2016, and again in early 2017, I tried the Borgoe line from Suriname – all 40% rums – back to front, front to back and side by side, twice, and it’s time to see what they’re all about. After all, we all know of the big guns in the rum world but the lesser-known operators deserve their moment in the sun as well. 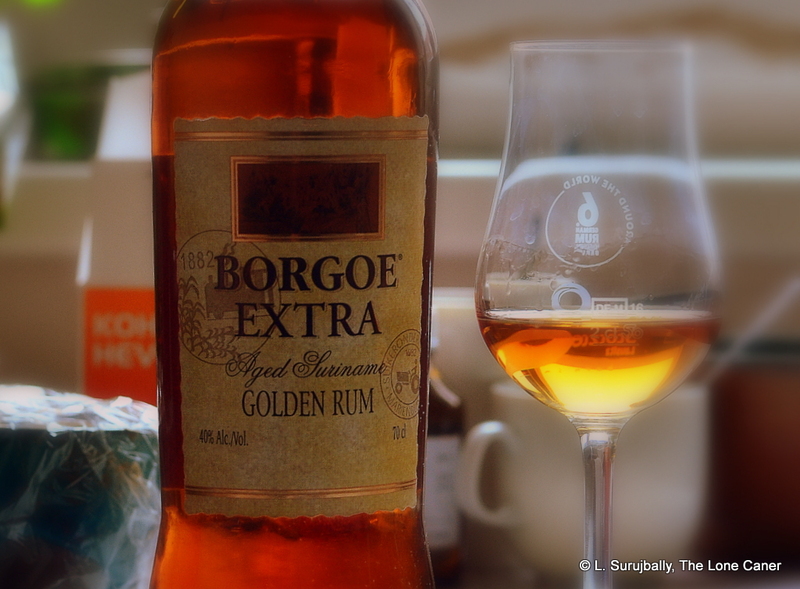 So let’s start at the bottom and work our way up to the top, young to old, beginning with the Borgoe Extra, an “Aged Golden rum”: this is the light, low-end mainstay of the brand’s offerings, the way the V/X is for Appleton, or various 3-year olds or “gold rums” are for other makers. 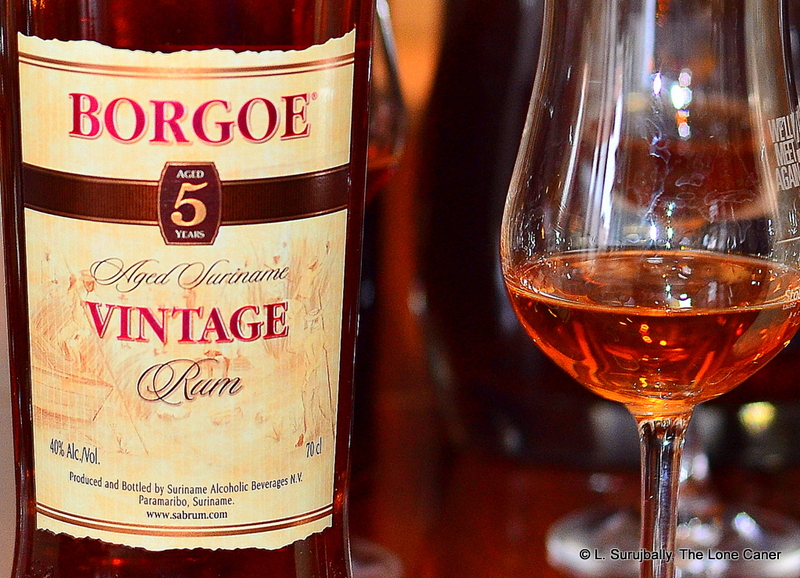 It’s a successor to the Borgoe ’82 rum first introduced in 1982, and I believe it to be around three years old (other products are the 5, 8 and 15 year old rums), a blend aged in American oak barrels and issued at the usual 40% after being filtered twice. Smelling it revealed no real markers of distinction such as would make one wonder into what magical terroire of the mind one had just stumbled all unaware. It was redolent of fleshy fruits, some cherries, caramel and some nougat, nothing terribly complex or ambitious. After resting for some time and coming back to it I could detect orange peel, a flash of something sharp and bitter, cinnamon and some herbs, so pretty standard, all in all. I liked the palate more than the nose (usually the opposite is the case with really young rums, at least for me). It presented as somewhat sharp; then came a swift procession of salty caramel, more nougat, white toblerone, and nuts. An amalgam of a few fruits, — peaches, unripe green apples and ginip, all muddled together — plus the slight citric sting of orange peel again There were faint notes of olives and brine (very faint) and oaken tannins and the bitterness of raw wood chips still bleeding sap, and the whole thing, while quite light, was thin and sharp too, with a short, spicy and rather unremarkable finish mostly providing a closing sense of caramel, apples and sugar water. Overall, rather uncomplex and unexciting: there was something going on here, just not too much of it (certainly not enough) and it’s insufficient to get excited about at this stage. A word should be spared for the notation that it is not really sweet and quite thin (“scrawny” was the word I scribbled down), which leads me to surmise that dosing is not part of the assembly. Thinking further through the tasting experience, I believe that thinness aside, what it really lacks is distinctiveness (and, perhaps, punch). The filtration is part of the problem, as is the anemic 40%, and also the column still makeup of the blend leans heavily towards a lighter, more Spanish style. It could just as easily be any young rum from the Dominican Republic, Panama or Belize, and I think the company is much like Banks DIH in that it sticks to the low-strength blends without doing enough to create a particular and clearly Surinamese profile which could potentially showcase the land of origin. It therefore cannot and should not be used on its own; and given its generic nature, I’m not sure whether there’s any particular cocktail that would be made with it to demonstrate and capitalize such attributes it does possess. I mean, when you taste a Jamaican, a Guyanese rum from DDL, a St. Lucian or a Bajan FourSquare, you can, with a little experience, use them as markers for the entire country. That’s one reason why they’re so popular – it’s their unique and country-specific profile that makes people go after them and actively source really old expressions. I think SAB might be sitting on some untapped potential just on the strength of this little rumlet — if they were to go with local cane, utilize that pot still more often, and produce some limited editions of greater power. But perhaps we have to go up the ladder to see what the brand has on offer, and if that half-sensed potential I mention can be seen in older variations…or not. Rather than go into a long history of the company, I’ll direct you to the Marienburg 90% review with its thumbnail recap for those who are interested. The production process is based on molasses sourced from Angostura in Trinidad and not from Guyana right next door, surprisingly enough, and after fermentation, the wash is passed through a columnar still, the resultant being used to make the rums which are aged in American oak barrels. The website of the company notes that a second still is used to make high ABV neutral spirits for the pharmaceutical industry, and they have a third copper still (they call it a “hand still”) for heavier rums – I am assuming this is the pot still some have mentioned to me, though exactly which rums this makes is still unclear at this time. 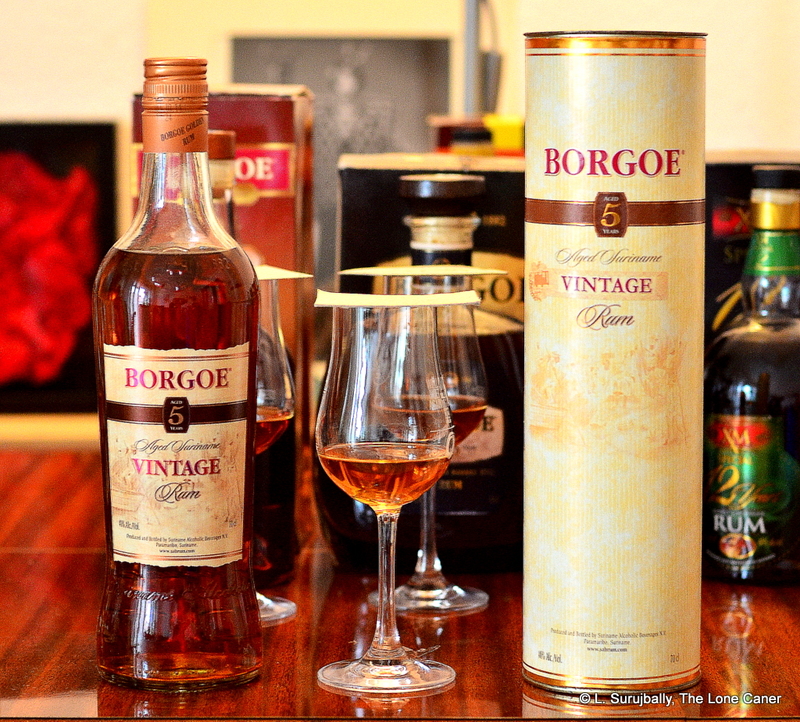 Since the entire line of Borgoe aged rums is blended, no doubt some portion of the pot still finds its way into the various expressions, much in the same way DDL does it with their various stills and the standard El Dorado line.